Ombak Sunset Good 7.8 Ombak Sunset is a great resort located away from the noise in the island center. Staff are friendly & rooms are well maintained. With it's private beach & restaurant it was easy to relax & enjoy the brilliant sunset. We used push bikes to get around the island & the resort was only a short ride away from the bars and restaurants in the port. (just make sure you have a light for your ride back to the resort at night). Would definately stay at the resort again. Gili Villas Fabulous 8.6 Gili Villas - a tranquil sanctuary.Down a side street away from the very busy main street of Gili Island, but just a very short walk to all the restaurants & bars, Gili Villas are very central to everything you need on the Island. The Villas are very spacious and comfortable. A large Private pool, air con for a good nights sleep & breakfast cooked for us in our kitchen every morning was a treat. The staff were all very friendly & helpful. 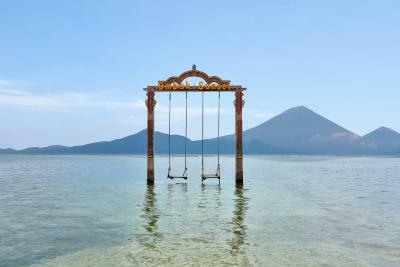 Les Villas Ottalia Gili Trawangan Good 7.9 The staff we're very friendly, attentive & helpful. The villa was a little out of town (5-10 min bike ride) allowing us to get away from the hussle & enjoy a quiet nights sleep. The free bikes & snorkling gear made it easy to explore & create your own adventure. I would definitely come back!!! Absolutely loved it! Kokomo Resort Superb 9 Everything was perfect! The location is great: close to all the busy bars and restaurants but still in a quiet area. 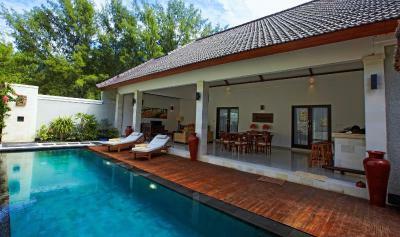 The villa is big and great, the pool was small but warm then so more an asset in the end. the breakfast was just the best I have ever had in a hotel: big and high quality. My Gili Cottages Good 7.3 Great location. Clean accommodation. Great breakfast. The owner was so friendly and helpful. Manta Dive Gili Air Resort Very good 8.3 Traditional architecture located just back from the beach. Fantastic staff, comfortable rooms and a beautiful outdoor bathroom. Set up for divers but occasional snorkellers and beach loungers just as welcome. Loved our stay. Dejavu Hotel Good 7.5 I would definately stay here again! Staff were very welcoming and friendly. If ever we needed something whether it was a bike or a tour advice they were more than happy to help. The room was very clean and i loved the outdoor bathroom. Perfect location, right on the beach and central to the main drag! It was a very enjoyable stay. Thanks guys! Karma Kayak Very good 8.2 The main woman running the place (nico I think her name was) was v helpful and friendly! The pool was a lovely size and the beach front was like something from Robinson Crusoe really private and nicely done. Overall its a small property but its quiet and low key, very relaxing.